Your Emails are getting opened but after then it’s getting spammed. If you are facing the second issue then definitely there is a problem in your content as your emails are getting rejected after getting opened and read. Content is that part of your email which decides the future of it. If your customer are not likely to read your content, keep a note they are not going to remain as your customers for much longer. Dynamic email content is where we use what we about our subscribers to create more relevancy. It differs from classic emails as it takes further by using the information to display different content to different person. For example, if you are selling clothes and you know the gender of your subscriber, using dynamic email content you can send all new Men’s apparel to your male subscribers and all new Women’s apparel to your female subscribers. 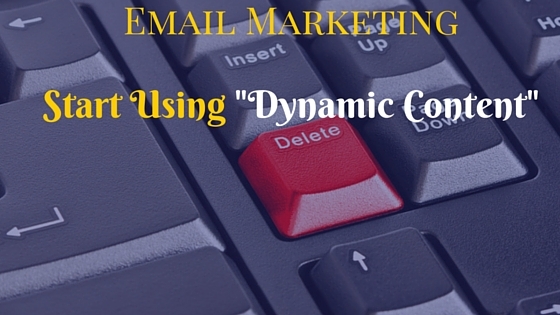 Dynamic email marketing can be the gravy of your marketing program. So, maximizing the attention your emails gets by showing content that will grab your subscribers is really important. Act-On displays Dynamic Content through text blocks, images, call to action, checkboxes, lists download and more. With this software you are empowered to tailor your content and offers based on an demographic information, purchase history and preferences. Blue Core software asks you what behaviours are the most important to drive conversion, and then it follows them automatically as per the present situation. Using this software is as easy as pasting a snippet of code into your site. Boomtrain is a personalized notification platform. We enable customer companies to send email and push notifications that are uniquely customized with the content we know is most likely to engage each individual recipient. More relevant content means better engagement, higher return, and a better brand experience. The Cordial platform listens and learns from customer behavior as it happens, enabling you to deliver the best possible message, in real time, on any device. With Cordial’s Triggers Marketing Technology, you can capture and respond to every digital interaction and connect to customers in the moment—in tune with their location and devices—online and offline, based on the steps they’re taking, and what they’ll do next. HubSpot is a powerful, easy to use, integrated set of applications. With it’s help businesses can attract, engage, and delight customers by delivering inbound experiences that are relevant, helpful, and personalized. It makes dynamic content possible in automated workflows. The Kickdynamic platform enables you to send contextual, personalized email content and messages with just a single email launch, easily and at scale. Kickdynamic’s rule builder will response to the exact contextual situation of your customer for a personalized email experience, every time. Liveintent provides real time advertising technology for email. This software allows to manage your advertisement through emails. It servers up ads in email dynamically based on the context when the email is opened. Movable Ink integrates into ESP and allows you to target in individual clients based on time, Geo location, device, weather and other consumer contexts. Through it you can also upload multiple creative variations to cater to your entire audience’s need. Nifty Images provides highly personalized images in email that allow you to segment any subscriber variable. You can integrate it with your current ESP to provide customized images to each and every reader. Pardot allows you to display content based on your client’s email activities, geography, job title, it even tracks your subscribers city or state. With Pardot you can display upcoming events based on your recipient’s location for heavily targeted mailing. PowerInbox is revolutionizing the email industry by bringing real-time capabilities to static mail programs dramatically boosting engagement. PowerInbox provides an easy to implement solution that combines real-time capabilities, dynamic animation, device and geographic targeting with personalization to ensure higher click through rates. Realtime email offers capabilities to create & deliver content that responds to each opener’s personal context, in real-time. By this you can optimize your email by using contextual data. Simple Relevance uses a machine learning engine to digest your reader’s demographic, psychographic and behavioral data. Simple Relevance makes your data to automate your most successful marketing through many digital channels, including email. Weather has a profound impact on what and when consumers purchase. With Skymosity’s Weather Analytics Platform, you can gain actionable insight on how weather influences your business. Rainmaker technology increases your email revenue with triggers that deploy emails to the right person at the right time.